This is a very humourous YouTube video of a lad who recognises a missing element in his life, knows what is needed and puts the plan into action. I have just finished listening to "Don Quixote" by Miguel de Cervantes Saavedra. The audio book is over 36 hours and is very funny. It was written in the early 1600's and the author mentions that he was involved in the Battle of Lepanto. The basic book is a satire, attacking all the books of knights and chivalry which were currently the rage. Don Quixote has gone mad, believing that the tales of knights are true and decides he, too, will be a knight errant. With his trusty squire, Sancho Panza, they go out seeking adventures which rarely end up as envisaged by Don Quixote. The humour from over 400 years ago still comes through today. The translation is impressive. I suspect that the translator has replaced Spanish proverbs with similar English ones as they all seem to rhyme, which I would have thought would be difficult if this was a straight translation. "Lana, my love. I have returned from my sally forth into the wilderness beyond our lands. I have fought corrupt data, wrestled with unbalanced ledgers and subdued unruly end users. I have brought order from chaos and run mighty reports. All this, I have done for you, my unparralleled beautiful Lana." To which I was rewarded with her enigmatic smile. For what greater reward could I ask? Wikipedia has quite a detailed entry on Don Quixote for those interested in more information. Game Theorist is a very interesting blog concerned with the economic realities of raising children. Today he has a post regarding a conversation with his son, asking "What if ..."
I'm sure we have all experienced something similar. Jesus answered [Nicodemus]: Amen, amen, I say to thee, unless a man be born again of water and the Holy Ghost, he cannot enter into the kingdom of God. So, as instructed, Martin was baptised yesterday with much feasting and rejoicing. 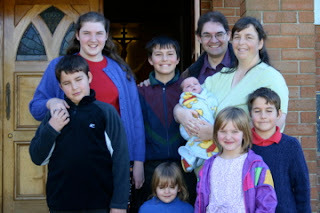 We timed the baptism so that my parents from Melbourne (over 800km/500miles away) were able to attend, and it was the regular monthly homeschoolers day, too. So that meant lots of children and family support. Our biggest nervousness was with the godfather. He was late and luckily just made it in time. 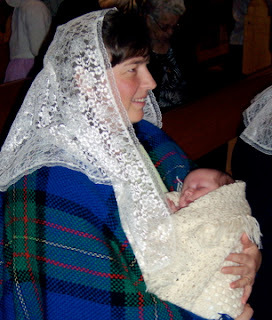 The role of the godparents is to vouch for the infant and in addition to the parents promise to assist the child in living and learning the faith. Martin did very well and calmly accepted all the ceremonies and at the last pouring of water upon his forehead, "I baptise you in the name of the Father [water] and of the Son [water] and of the Holy Spirit [water]" Martin gave a small cry. Father made the comment, "See, the Holy Spirit does work!" My previous post "The Art of Planning" has led to further discussions with friends and a lot of reflection. I think there is a fundamental disconnection between the way we (heirs to the English legal system in Australia, America and the UK) view law and the way the Church views laws. Jimmy Akin discussed this difference in two posts suggesting it is a difference between "High" and "Low" context cultures. His theory is that some cultures - including that of the Church - do not have laws and rules that are cut and dried but need a deeper understanding to understand the nuances. Whereas the culture we live in is a Low context culture in that an immigrant can arrive on our shores and quickly assimilate and do well as the rules are pretty easy to follow. Jimmy suggests that this is why we have such difficulties with Church law. With our laws our mindset is to work out how to get away with minimum compliance and expect full enforcement if anyone transgresses those laws. Upon further consideration I think the Church laws have to be seen in context of how the Church sees herself in relation to us and God. Everything the Church does is in the context of Family. Even the Trinity is a form of family, whereby the love betwween Father and Son is so deep that it becomes another person. Also, Jesus came into the world as part of a family. The prophets saw Israel as the spouse of God and treated unfaithfulness like adultery. The Church is considered to be the bride of Christ and we are the children of the Church. So when the Church makes laws and enforces discipline it needs to be viewed in the same way as parents enforce laws in a family. Also, those following the laws need to understand those laws as not just restrictions but rather directions for better living. When we lay down laws for our family, our ultimate purpose is in mind - God's Will and the gaining of heaven. When the children transgress the rules we have to decide the best way to enforce the compliance. Parents should not inflict "blind justice" as that leads to far too many injustices. Just examine some of the weird inconsistent punishments passed down by the courts or the ludicrous Zero Tolerance enforcements. Although I am often critical of the lack of zeal in upholding Church laws I understand some of the reluctance. However it does appear as if many bishops and priests suffer from the fallacies of soft parenting and seem to forget that no enforcement means the laws will be ignored. When the Church has a law we are to understand that it is issued in order for us to achieve our ultimate aim. So avoiding the law using a legal mindset applying every possible exception defeats the purpose and instead of gaining an advantage we only hurt ourselves. For example, the Church tells us we must attend Church every Sunday or we commit a mortal sin. The reasons are many and Pope John Paul II even dedicated an Encyclical to the topic of Sunday as the Lord's day. However, as this is Church law there are lots of valid reasons to miss Mass and not commit a mortal sin, such as sickness and caring for others. The key is to do our very best to get to Church and if the reason for not attending is beyond our control, you are not guilty of the mortal sin. But knowing that you must attend means that you will then endeavour to do whatever is necessary to keep the Lord's day holy and arrange affairs so that missing Mass doesn't become habitual. 3. With faith and fortitude follow the law to the best of your ability. 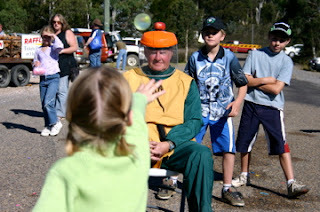 We recently attended a local fair entitled "Tumut Apple Day". It was a pretty low key affair but I thought this competition was a great idea. A brave fellow sat on a chair suitably protected with an apple sitting on top of his helmet. Then competitors took turns trying to knock the apple off with water balloons. The younger the competitor the closer he was placed to the target. I managed to capture this young girl tossing the balloon. She missed. "Don't you have a television?" "Two [or one] is enough for me!" ... and so on. But the one that has gotten me thinking is the question, "Do you plan on having any more?" My job is helping businesses integrate their computerised and manual accounting systems. This involves a lot of planning and working out the steps one must take to achieve the desired goal. After 25 years doing this kind of thing planning is sort of ingrained in how I approach most things. In a normal plan there are a number of key steps. 1. What am I trying to achieve? What is my goal? 2. What do I need to do or gather in order to get there? 3. How do I use those assets to achieve the goal? 4. How do I know if I have success? In the real world we know that what we start out aiming for frequently changes, but we modify our plans accordingly. Somehow, when most people talk about family planning, they don't do any real planning at all. If one wanted a family, then that means children. Yet "family" planning is primarily about NOT having children. And if you were "planning" on a family, you would work on your lifestyle and other areas to facilitate that end. Also, a child requires the activities of three people. The mother and father provide the material matter and then God provides the soul (or life-force) (or random chance by a blind evolutionary force - whatever). However you look at it the only decisive choice a couple may make about planning a family is to say "NO" or be open to life and hope and trust that "nature" or God will bless the couple with fertility. So normal planning involves positive actions in order to achieve the end result, while "family planning" involves negative actions to avoid or minimise the end result. Odd. The other bigger problem is that man is mortal and time stops for no man. The decision to delay a family is for many people the decision to have no family. 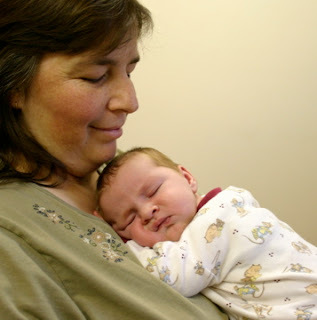 Fertility reduces as the partners age. So how do I answer the planning question? "Do I plan to have any more children? That isn't completely in our hands. We are only part of the equation. God is the one giving us the gifts. We'll just see what comes." So my family planning is working to provide a safe and faithful home in which to raise all the blessings we have. The actual quantity of blessings is not fully in our control so why worry about that. We believe that God won't throw anything at us that He knows we can't handle, so we pray for the strength to handle the things he does throw at us. Note: Danielle Bean and Domenico Bettinelli have been talking about this very thing too! Every year around this time we have a bonfire. The bushfire season is over, the nights are cooler and fire risk is lower. Throughout the past 6 months we have gathered branches, sticks, logs and stray bits of wood into a lovely pile. It's really a lot of fun gathering around a bonfire on a cool night, armed with a variety of sticks toasting marshmallows or cooking damper. Damper is little more than a flour and water mixture, wrapped around the end of a stick. It is cooked over the flames or embers until it gets cooked - rather than black. Then it is pulled off and butter and Golden Syrup is spread on the inside. Messy but certainly tasty. Outside is definitely the best place for this type of thing. Peter had a new defense against the flames this year. Last year he hid in a plastic tube, but this year he used his shield with it's new silver bowl in its centre. 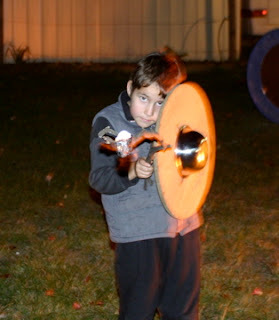 His shield is made from one end of an electrical cable spool. He was able to peek through the holes in the wood to judge the appropriate cooking placement for his stick. Peter reckons this was a much better solution. Today we finally attended Mass as a full family again. Martin is now 2 weeks old and Lana is recovering well. It's amazing how quickly one forgets the early baby days. The last 2 weeks have been a time of re-aligning sleep and waking schedues as we encourage Martin that "Night time is sleep time!" His sleep/awake ratio is improving as he is getting his fill and learning how to digest his meals. All the children are very proud of the latest Bruggie (version 7).